Thanks to the presence of a robust Polynesian culture here in Utah, it's possible to find authentic Hawaiian-style cuisine right here in the Beehive State. I've written before about places like Mo' Bettah Steaks and Big Sai's Hawaiian BBQ, both of which I like a lot. But I recently discovered two more Hawaiian eateries—each very different from the other in menus and style—that are equally excellent. Moki's Hawaiian Grill is located on a section of Redwood Road that is a smorgasbord of ethnic flavors and eateries. There's lots of parking, and Moki's is very roomy, decked out with plenty of Hawaiian kitschy décor like ukuleles, beach signs, shark's teeth, tables with surfboards etched into them, Hawaiian and reggae music playing, etc. But somehow, it all works together. The folks who run the place are Hawaiian, and frequently speak in Hawaiian among themselves; guests are greeted with a friendly "Aloha!" Moki's is primarily known for what in Hawaii is called the "plate lunch," although there's no reason you can't have it for dinner. The prototypical plate lunch is one or two proteins with macaroni salad and scoops of white rice alongside. Food historians say that the plate lunch has its roots in the Japanese bento box lunch. Most plate lunches at Moki's run from about $8.50 to $9.95, and include a salad (macaroni, Hawaiian chicken with Asian noodles, tossed green salad, or spinach with feta cheese), two scoops of white or brown rice and sliced pineapple. It's a lot of food for the price. My favorite dish is the Two Meat Combo ($9.50). And, my go-to meat selections are the chicken katsu and kalua pork. The chicken is like German schnitzel or Japanese katsu (which are both usually made with pork). In this case, it's a boneless chicken breast pounded thin, then breaded and deep-fried in oil. The chicken is golden and crisp, served with a tangy dipping sauce that I love; it tastes like a tropical marriage of fry sauce and ponzu. But the pork ... oh, the pork. The kalua pork (shoulder, think) is smoked, shredded and served with chopped cabbage. It's so tender and juicy that it requires no sauce at all. Other lunch plate options include Korean-style kalbi ($8.95), teriyaki beef ($8.95) and another of my favorites: Loco-Moco, which is hamburger patties topped with fried eggs and gravy ($8.95). On a visit to Hawaii, I discovered what would become one of my favorite foods: poke. I've heard it pronounced both "po-key" and "po-kay." Take your pick. It's a fish (usually tuna) salad that's typically served in Hawaii as an appetizer, and it's so ubiquitous there that you can get really good poke at grocery-store deli counters. It is most often made with yellowfin tuna, chopped into bite-size pieces and tossed with soy sauce, sesame oil, sea salt, seaweed and chili pepper or chili sauce. The poke is served raw, similar to ceviche. There are many variations, but that's the basic recipe. The poke salad ($9) at Moki's—listed on the menu as a "side" dish, but generous enough to serve as an entree—was fresh-tasting and very good, and came with a large scoop of sticky rice and pineapple. If you're looking to round out your poke meal, I'd recommend a side of manapua: steamed pork buns ($4). Moki's also offers smoothies, Hawaiian shaved ice, shakes, Hawaiian Sun sodas, and the perfect closer to any meal: the Hawaiian doughnut with ice cream, strawberries, pineapple and whipped cream, called mokisada ($5.95). I'd always thought that poke was limited to what I've described above: basically, raw tuna with fixings. That is, until I visited the Laid Back Poke Shack, which might as well be called "Poke R Us." At Laid Back Poke Shack, the aforementioned tuna poke is merely one of some dozen or so poke options available on any given day. For example, on a recent Friday, the poke choices included shoyu ahi, ginger ahi, spicy ahi, oyster ahi, California spicy ahi, shoyu salmon, sesame calamari, kimchi tako, sweet chili shrimp, kimchi mussels, taegu (Korean seasoned cod) and spicy snow crab. The shoyu ahi is the standard ahi tuna with soy, sesame, etc., and it is excellent. But it's also interesting to try the same fish—ahi—with other flavors and seasonings, like ginger or oyster sauce. The poke options at the Shack can be daunting. Thankfully, the folks who work there are super helpful and ready to guide a poke rookie like me through the various choices. There's a sampling station where you can "try before you buy" any or all of the poke flavors you desire. To be honest, I'm not a huge fan of octopus, which tends to be too chewy. But at the Shack, the tako (octopus) poke was terrific. The menu setup is simple: There are small and large poke bowls priced at $11.50 and $14.50, accordingly. They come with rice and a choice of one or two pokes. The small bowl looks small, but was more food than I could finish at lunch. When all the poke cleared, my favorites were the California spicy ahi (with avocado) and the luscious snow crab (the crab is cooked). 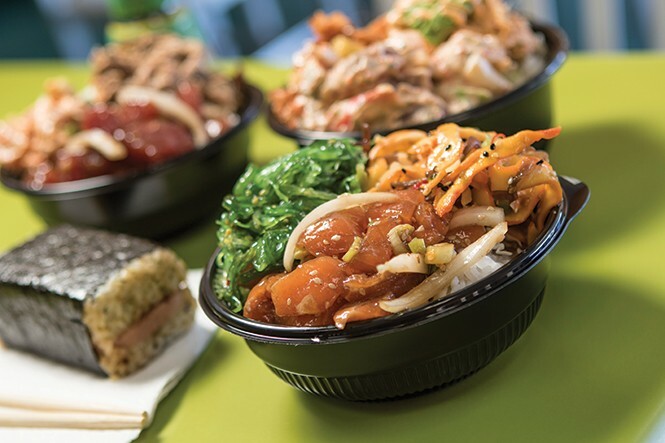 The Laid Back Poke Shack also has a handful of non-poke menu items such as kalua pig and a native-to-Hawaii sushi-like snack called musubi. It's grilled Spam on sushi rice, wrapped in nori (dried seaweed). Hey, don't knock it until you try it.